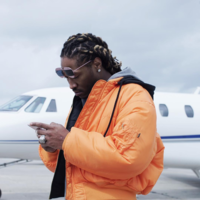 Future’s fame as a songwriter finally broke through to the mainstream when he penned most of YC’s Braggadocios BET Hip-Hop Award nominated blockbuster “Racks featuring Future.” The chorus, “I got racks on racks on racks…” became an instant smash in the clubs, on the radio, and was adored by everyone from fans to major artists such as Lil Wayne. “Racks” bubbled in the underground circuit of the south for six months before popping into mainstream this summer. In the meantime, Future started capitalizing on his buzz by putting together immaculate mixtapes such as Dirty Sprite. Songs such as “Tony Montana” would solidify him as the leader of the new wave of Atlanta bred superstars.